Different types of DNA damages caused by ionizing radiation may enhance the cancer risk in exposed individuals. Inherited variations in DNA repair genes cause the inter-individual variability in response to ionizing radiation. The purpose of this study was to determine the association between single nucleotide polymorphism (SNP) of two important DNA repair genes (XRCC1 R399Q and XRCC3 T241M) and the level of DNA damage investigated by micronucleus (MN) frequency in peripheral blood lymphocytes of 120 industrial radiographers (IR) and 120 non-exposed control individuals. The frequencies of MN and nucleoplasmic bridges were significantly higher in the IR group than in the control group (33.83 ± 11.96 vs. 7.47 ± 2.96, p < 0.0001 and 1.69 ± 1.86 vs. 0.12 ± 0.33, p < 0.0001). MN frequencies in the IR group were associated with the cumulative radiation doses (p < 0.0001, r = 0.58 for last 1 year of exposure and p < 0.0001, r = 0.67 for last 5 years of exposure). Polymorphism of XRCC3 T241M was associated with higher MN frequencies in the IR group. However, the same result was not observed between XRCC3 SNP and MN frequency in the control group. Consequently, XRCC3 241Met alleles may cause the increased DNA damage in the industrial radiographers. This work was supported by the Iran Nuclear Regulatory Authority. 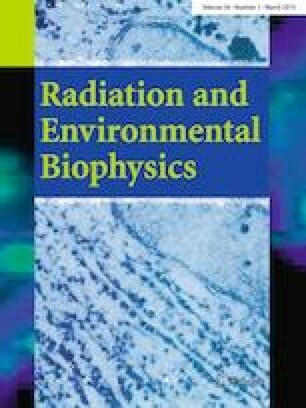 The authors thank all of the industrial radiographers and the personnel of the Biodosimetry and Medical Care laboratories for their assistance.